La Maison Carondelet is a beautifully restored mid 1800’s era home located in the historic Garden District of New Orleans. Built in the Greek revival style popular in New Orleans during that era, our fully furnished guest house has three bedrooms, two and a half baths, a large gourmet kitchen, a front porch, front and side balconies, washer and dryer, alarm system, one off-street parking spot and a spacious landscaped patio with a hot tub. Centrally located and just one block off St. Charles Avenue and the streetcar line, there is no better way to enjoy New Orleans than in the privacy and comfort of La Maison Carondelet. La Maison Carondelet is available year round and can accommodate lodging for groups of up to six people. We can also provide a wide range of reasonably priced concierge services including: catering, cleaning and/or laundry service, pre-stocking the house with items of your choice, grocery service, ticket service, reservations, directions and advice to help make your stay in New Orleans as fulfilling as possible. House is well maintained. Baked goods in kitchen upon arrival. The house is well located, one block off St Charles where there is access to street car. Owners were caring about our needs during the stay. Overall we loved the home and the location was central to the Garden District, Magazine St and access to the streetcar to downtown and the French Quarter. The house was well appointed and fit our family of five perfectly. The only down side was the construction next door, which is only temporary and the house needs a little TLC. Of course, it is an old home and it's truly an experience we don't get on the West coast. It's quite a charming home and accommodates 5-6 people perfectly. Marlee M.Where do you live? Perfect location for our needs, close access to streetcar line and the hot tub was an added bonus. 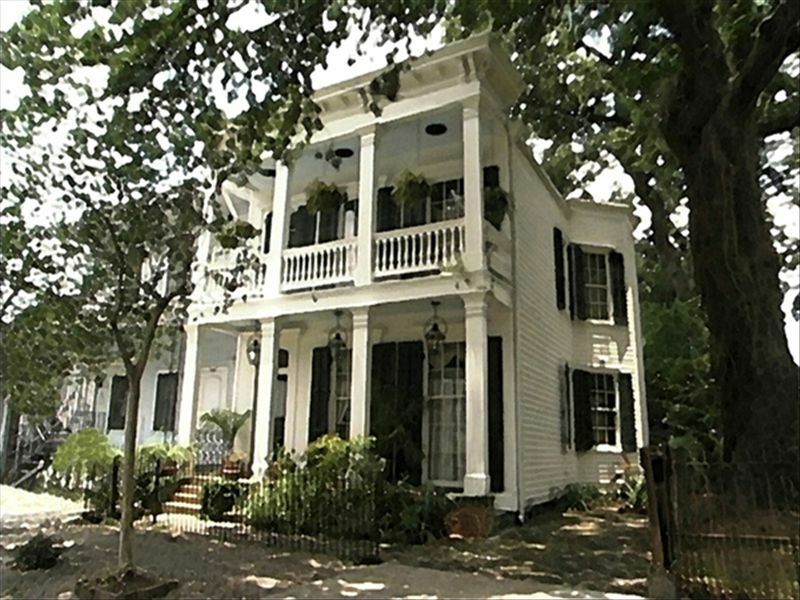 This beautiful historically significant house was perfect for the needs of 6 people. The house is very attractive , historically dignificant, clean and well equipped. The kitchen is large and perfect for cooking and eating .There are Ample bathrooms. Beds are comfortable. 2 sitting rooms provided spots to lounge. One opens to a very nice back yard. House is eqipped with everything we needed. The neighborhood is quiet. It is an easy walk to the trolley, restaurants and shops. Our group had not one complaint. We were very happy there and impressed. We vacation together 2 times a year so have been in many other rentals. We found this house to be perfect for us. We were three couples enjoying a long (three night) weekend together in New Orleans. Maison Carondelet was the perfect spot for our getaway. Linda and Conrad were gracious hosts and were responsive to all inquiries both before and during our stay. They thought of everything that would make our trip enjoyable. Their historic home is beautiful and located on a quiet street one block from St. Charles Avenue and the Lower Garden District. The rooms are very large and simply furnished “shabby chic” style. The three bedrooms (two queens and a king that can be converted upon request to two twins) are very comfortable. The living areas are spacious with comfortable seating. The master bath is unique and well designed with a clawfoot tub and separate shower. The second full bath has a claw foot tub/shower (we have suggested replacing the shower head). There was plenty of hot water for six people. There is a powder room on the first floor. The kitchen has modern appliances, and is well designed and equipped for food preparation. Linda and Conrad thoughtfully provided some baked goods, a bottle of prosecco and some orange juice for our first breakfast. It was Super Bowl weekend and we easily prepared our dinner and appetizers in the kitchen for the big game. The front porch, rear patio and hot tub were the perfect places to kick back after roaming the French Quarter, Garden District and Magazine Street. The house’s location just a block off St. Charles made the street car and Lower Garden District readily accessible (you can walk to/from Commander’s Palace!). I travel to New Orleans frequently and have rented a number of homes in the city, and I would highly recommend Maison Carondelet to any small group traveling to New Orleans..
Great house. Conveniently located. Second time here, and will be back again!!! Perfect location. I love this house!! !